Suldog: Doug Flutie & The Presidential Debates! Following up on my ability to link Fried Chicken, The Boston Marathon & Hillary Clinton, today I managed to drag Doug Flutie into a column mentioning the upcoming presidential debates. Yes, Doug, I know. You're as amazed as everybody else. P. S. The last sentence above is more of a hope than a guarantee, but you probably knew that already. P. P. S. The photo came from HERE, where you can hire Doug Flutie to speak at your next function. Since I have now mentioned him both in my blog and on the pages of the Boston Herald, it's likely he'll become somewhat famous. Get in on the ground floor! I have always loved Doug Flutie; he was a creative and winning quarterback wherever he went, and I agree with you that he got a raw deal from the NFL. Why Joe Theismann (another 'undersized' CFL refugee) got a long-term starting gig in the NFL, and Flutie didn't, is just beyond me. But have you ever seen a CFL game? That league is created for funny-money passing stats. A lot of fun to watch, but 6000 passing yards there is kinda like Sadaharu Oh's 900 home runs - it ain't quite apples-to-apples. . . I wish he'd had the chance to spend those best years testing NFL defenses, and it's a travesty that he didn't. He's probably better than a lot of PFHOF guys (*cough*JoeNamath*cough*), and he might even deserve to be in the Hall. But CFL numbers aren't comparable. . . I enjoyed seeing him doing color commentary for my Spartans this past weekend. But jeez, NDC sure makes those guys sell their souls to the Irish. . .
You make an excellent argument as well as the defining reason it will not happen. Still he was an outstanding QB. My greatest memory was watching his game one Thanksgiving at my mom's with all my family...I assume it was Thanksgiving. I had the flu and was passed out on the floor, unable to stay conscious. I managed to open my eyes for just a few seconds and saw his hail-Mary pass to win the game and probably wrap up his Heisman Trophy. I said, "WOW! that'a unbelievable." and then fell sound asleep again. Craig - Oh, sure, when Flutie was in the CFL, his games were regularly broadcast in Boston. I saw loads of them. A lot of people won't remember this, but the CFL expanded to include American franchises for a couple of years (I recall Baltimore and San Antonio off the top of my head) and that was as a direct result of how popular Flutie's games were south of the border. I know it's not comparable, but you can easily extrapolate 4,000 yard NFL seasons during his prime, at least. And his CFL rushing stats, which I didn't have room for, were amazing. 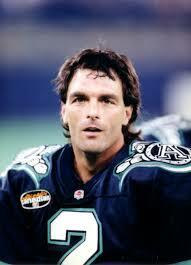 Put Flutie in his prime in today's spread offenses and he'd rip the league apart. Another thing I didn't have room to include is that, not too long ago, Flutie was voted the #1 player in the entire history of the CFL by a panel of Canadian football beat writers. If that doesn't qualify him for inclusion in the PRO Football HOF, I don't know what possibly could. Joe - Believe it or not, that was one of the few Flutie games with BC that I actually didn't watch live - or, at least, not all of it. My Dad had a flight overseas that day and I gave him a ride to the airport during the second half. It was during the ride home from giving him that lift that I heard the play on the car radio. Of course, I've had ample opportunity to see it since then! One thing not a lot of people realize is that the Heisman voting was compiled PRIOR to that game. He already had it won. Of course, after that play, had he not won it, there would have been a federal investigation! Most people remember the final play, but the thing I remember about that BC-Miami game is the whole 4th quarter, the way the two teams just went punch-counter-punch repeatedly, taking the lead from each other again and again. There must have been five lead changes in the 4th quarter alone. . . It says more about the process than the person when the best do not get in. He won before that game? I did not know that. BTW, 5'10" 185 lbs would have been a big QB in the 50's and even the 60's when a little guy good at hiding the ball on fakes was more important than seeing over lineman to throw. You forgot to mention that Doug Flutie was a contestant on Dancing with the Stars, partnering Karina Smirnoff, earlier in 2016.... OK he got booted off the show after 3 or 4 weeks, cant remember how many, but he did almost as well on the dance floor as he did on the football field IMHO.